Easy 3 Ingredient Banana Crêpes - simply & healthy vegan recipes that taste amazing! Blend the banana, grated coconut and the oatmilk together until very smooth. Add the flour, baking powder and salt to the mixture. Mix or blend. Let it set for about 15 minutes. Heat up coconut oil in a crêpes pan. Add about 1/4 cup of the butter. Cook the crêpes for about 1 minute on each side. 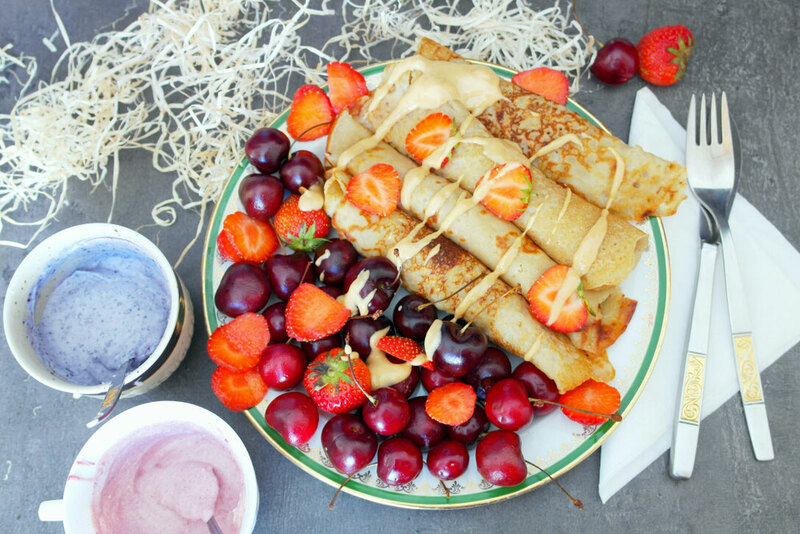 Serve your crêpes with summer berries (cherries and strawberry for exanple) or some aquafaba chocolate mousse! Zuerst die Banane, Kokos und Hafermilch mixen bis es ganz flüssig ist. Ca. 60 ml von dem Teig in die Pfanne gießen. Auf beiden Seiten ca. 1 Minute anbraten lassen. Mit sommerlichen Beeren wie Erdbeeren und Kirschen servieren, oder auch mit Schokomousse! Follow me on Instagram for more recipes and pictures!